Every day that I come in to serve at the Marine Science Center I try to find something that inspires me to do the work I do and enjoy my day. Often, it's the gorgeous view of the Marine Science Center pier and Point Wilson, with water and mountains in the distance. Other times, it will be a conversation with one of my fellow AmeriCorps team members. Sometimes I take a fresh look through our collections, examining a plant or animal that I don't often pay close attention to. Last week, I was inspired by some of the new animals in our tanks, as I always am! 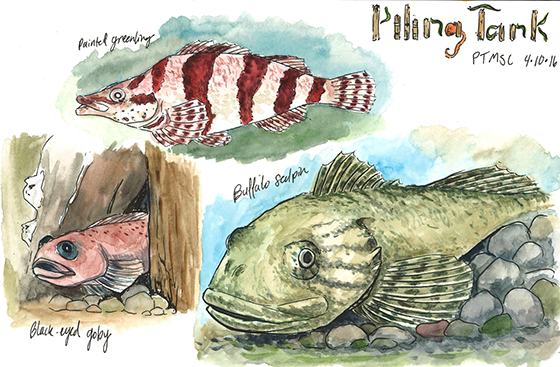 I followed my natural impulse to draw what inspires me and ended up doing a few portraits of our new fish in the Piling Tank. Spending time observing these fish motivated me to learn more about them — I didn't know before I started painting it that the Painted greenling can hide in fish-eating anemones without getting stung, but now I do! Now that the Marine Exhibit is open again, you can come by to learn more about these fish and all the other awesome plants and animals we have in our collections. Maybe you will find something that inspires you! There are also lots of beaches around the Marine Science Center and in Port Townsend to explore, with more plants and animals to look at now that there are low tides during the day (and good weather to enjoy them). 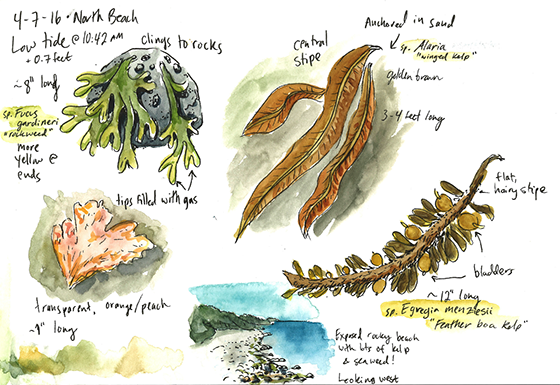 I went out to North Beach a couple weeks ago to do some tidepooling and found a great variety of kelp to journal about. If you decide to go tidepooling, don't forget to check the tides and follow Tidepool Etiquette while you are on the beach! CAROLYN WOODS is the Natural History Exhibit & Volunteer Educator and an AmeriCorps Member serving at the Port Townsend Marine Science Center. Read more of Carolyn's posts on our blog!